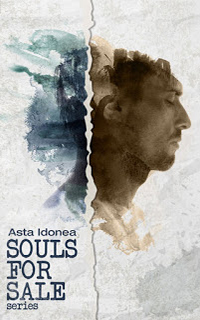 For the next 24 hours only, grab your copy of my paranormal MM short story + novella combo Souls for Sale from All Romance eBooks for the bargain price of $2.50! That's a whopping 50% off!! 21st Century Demon It should have been an easy job: a contract signed and a new soul earmarked for Hell. But when suave demon deal-maker Saul chooses nerdy Thomas Ives as his next target, events take an unexpected turn. The lines between business transaction and pleasure blur, and Saul must decide whether he cares more for his professional reputation or the soul he just condemned to eternal damnation. Hell to Pay The contract was destroyed and Tom's soul saved from Hell. Or so they thought. Demon deal-maker, Saul, and his mortal lover, Thomas Ives, find themselves on the run when the other demons take none too kindly to Saul's bending of the rules. With the denizens of Hell on their heels, Saul and Tom must fight to stay one step ahead, knowing that if they're caught there's only one direction they're headed: down. When Heaven decides to get involved, Saul's actions are no longer a mere bureaucratic misdemeanour but the basis of a factional confrontation. And now only one question remains: to whom does Tom's soul truly belong?